Some of us can remember the time we were in charge of putting together the menu for a party and we chose all the things we liked. Then we were left with all kinds of leftover meatballs and cold cuts. Take the easy approach and work with Brenda and Stan of Marujyu Market Catering. 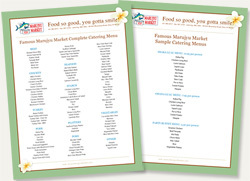 They have put together menus that are sure to please your guests! Choose from the Shaka Luau Menu, a eleven dish, complete Hawaiian luau food feast for big appetites. Or pick the Ohana Luau, a seven dish selection of Hawaiian luau favorites. The Party Buffet Menu pleases the local crowd with seven island favorites. Choose a menu, or customize your own. Click to view the complete catering list.